In recent years exclusionary policies of the Indian state have raised questions concerning social harmony and economic progress. During the last few decades the emergence of identity politics has given new lease of life to exclusionary practices in the country. Castes, communities and ethnic groups have re-emerged in almost every sphere of social life. This book analyses different aspects of social exclusion in contemporary India. Divided into three sections – 1. New Forms of Inclusion and Exclusion in Contemporary India; 2. Religious Identities and Dalits; 3. Ethnicity and Politics of Inclusion and Exclusion in the North-eastern Frontier – the book shows that a shift has taken place in the discourse on inclusion and exclusion. Chapters by experts in their fields explore issues of inclusion and exclusion that merit special attention such as dalit identity, ethnicity, territoriality and minorities. Authors raise questions about developmental programmes of the state aimed at making India more inclusive and discuss development projects initiated to alleviate socio-economic conditions of the urban poor in the cities. As far as North-east region is concerned, the authors argue that there is a tendency to highlight the homogenizing nature of the Indian culture by stressing one history, one language, one social ethos. Diversity is hardly accepted as a social reality, which has adversely affected the inclusive nature of the state. Against this development the final part of the book looks at questions regarding ethnic minorities in the northeast. 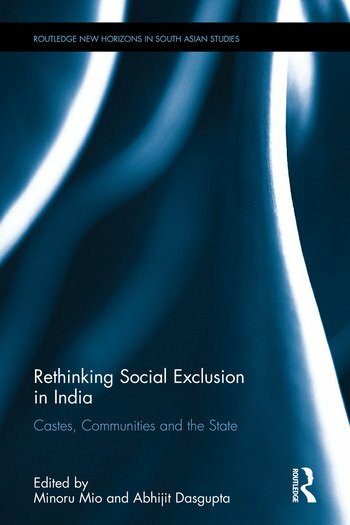 Offering new insights into the debate surrounding social exclusion in contemporary India, this book will be of interest to academics studying anthropology, sociology, politics and South Asian Studies. Minoru Mio is Associate Professor at the Centre for Research Development and Director of the Centre for Contemporary India Area Studies at the National Museum of Ethnology, Japan. Abhijit Dasgupta is Professor of Sociology at the Delhi School of Economics, University of Delhi, India.